iOS8 이상 버전이 필요한 트윅입니다. 이 트윅은 앱스토어의 앱이 시스템에 접근하는 것을 탐지하고 보호합니다. 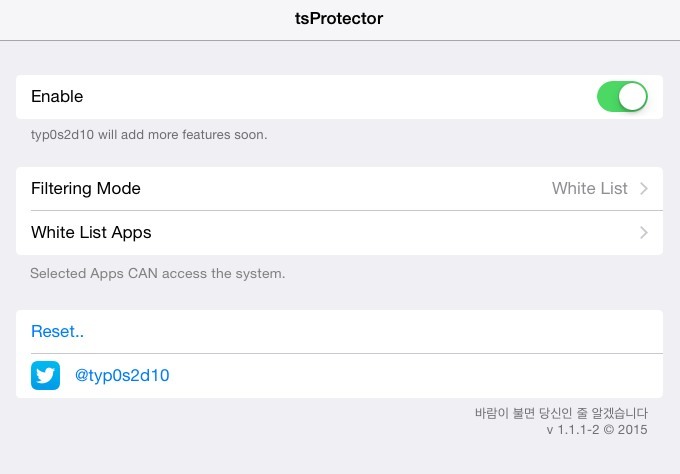 tsProtector P 의 iOS8 대응 버전입니다. 점차 여러 유용한 기능을 추가해 나갈 것입니다. 체험판에서는 허용우선으로만 작동하며 하나의 앱만 차단할 수 있습니다. 구매하시면 모든 기능을 다 사용할 수 있습니다. 접근탐지를 하지 못하거나 어떠한 문제가 생긴다면 설정에서 "문제점 보고하기"로 메일을 보내주십시오. 또는 트위터 @typ0s2d10 로 연락주시면 감사하겠습니다. 홈화면에 아이콘이 생기지 않으며, 설정앱에 설정항목이 추가됩니다. This tweak let you protect your device's system from AppStore apps. This tweak is the next version of tsProtector P for iOS 8. I'll add more features soon. In trial mode, it can be set only blacklist mode. You can add only one app to block access system. You want to use all feature, purchase it from Cydia. It does not work with all AppStore app, some apps maybe access to system even it enabled. If you would like to report any app that cannot be detected by this tweak, please report it to @typ0s2d10, can't guarantee a fix though. I also welcome bug reports via Settings. Thanks to Alexianos Noad(@alexianos_n) for translating. Configure tweak options from Settings app. No icon is added to the home screen. Change the way of app selection.